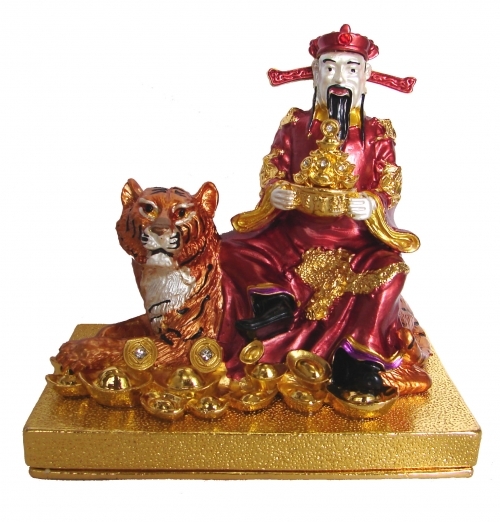 Designed with vibrant colors, sparkling jewels, and fine detail, this bejeweled figurine features the powerful God of Wealth on a mighty tiger. Placing this figurine in the center of your home during 2018 will enhance your home’s auspicious aura and bring in fruitful finances and wealth luck. The tiger is an ally to the dog (2018 is the Year of the Dog), so placing this auspicious figurine in your home, work, or office can greatly enhance your career opportunities, business success, and financial endeavors for the whole year. The God of Wealth holds a large heap of gold ingots and coins in his hands, and his cloak is decorated with gold. The powerful tiger also sits upon a pile of gold coins and gold ingots. The entire figurine is on top of a magnificent golden stand that is designed to resemble gold itself. In China, there are 2 Gods of Wealth: Wen Wealthy God and Wu Wealthy God. Wen God of Wealth is usually carrying ru yi and Wu God of Wealth is usually shown carrying a weapon. Wu wealthy god is good at Kung Fu. He can can ward off bad energy, misfortunes, and negative auras. A God of Wealth sitting on a tiger will bring wealth and protection. The dimension of bejeweled wealthy god on tiger is approx. 4.375" x 2.75" x 4". It is made of alloy.